The Oppo Find X is all about two things. Its pop up cameras and its screen. In fact, 93.8% of the front of the Find X is screen - meaning that the bezels are completely gone from three sides, with the 'chin' at the base of the screen. Besides, the unit also comes with plenty of power. That lets the show to last longer. With some fairly standard auto-beauty settings, and some much deeper individual tweaks like 'dermabrasion', 'slim face', and 'whiten teeth', the Find X can also employ 3D facial scanning capabilities. This technology allows you to create a kind of 3D-modelled death mask (or, as Oppo calls it, a 'Custom 3D Beautified Look') that apparently uses AI to apply 'delicacy', 'loli' or 'model' tweaks to the structure of your face in photos. The Oppo Find X is expected to launch sooner in India. The smartphone is the first Android smartphone to feature 3D Structured Light Technology. Using 15,000 facial dot recognition and intelligent analysis, 3D Face Recognition is 20 times safer than fingerprint recognition for unlocking the phone. It sports a 6.4-inch Full HD AMOLED screen with a resolution of 1080 x 2340 pixels resolution, and 19.5:9 aspect ratio. Thus, offering cinematic view. The mobile makes use of an Octa-core Qualcomm Snapdragon 845 that is coupled with Adreno 630 GPU, 8GB RAM and 128GB and 256GB default memory capacity. In terms of optics, the Find X sports an AI enhanced dual camera of 16 MP (f/2.0) + 20 MP (f/2.0) with dual LED flash. The features include 2160p@30fps, OIS, Geo-tagging, Touch focus, Face Detection, HDR and Panorama. Up front, the smartphone from OPPO makes use of an AI enhanced 3D camera, that houses 25 MP (f/2.0) selfie camera. In addition, it is equipped with a 3D lighting technique for artistic portraits and offers 3D emoji for funny expressions. The connectivity aspects include Wi-Fi 802.11 a/b/g/n/ac, dual-band, WiFi Direct, hotspot, v5.0, A2DP, LE, 2.0, USB Type-C, USB OTG, GPS, GLONASS, BDS and dual sim. The Find X packs a non removable Li-Ion 3730 mah battery, that comes with VOOC flash charge technology. It runs Android 8.1(Oreo) based on Color OS 5.1, out of the box. Sensors include fingerprint, accelerometer, gyro, proximity and compass. The handset will be available in Bordeaux Red and Glacier Blue colors. The Oppo Find X Price is Rs.59,990 for 8/256GB variant. Alleged Oppo Find X2 with Snapdragon 855 SoC gets listed on AnTuTu. The smartphone spotted on the benchmarking platform carries the model number OP46C3 and it is being suggested that the device might be called as Oppo Find X II or Find X 2. 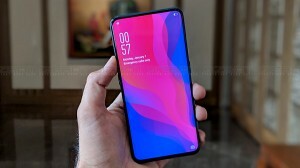 Oppo Find X spotted on Geekbench running on Android Pie UI. The premium category device that has been spotted on Geekbench carries a model number of PAHM00. Oppo Find X receives TENAA certification in China with 10GB RAM and 256GB storage. All you need to know about the smartphone.